Both of these teams have a strong Euroleague pedigree but they have both endured a terrible season. 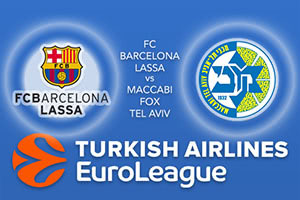 This is why Barcelona and Maccabi will probably be quite glad to see the back of this Euroleague campaign but there are still a couple of games to get over and done with. Injuries have caused no end of problems to the hopes and ambitions of these sides but there is certainly a desire to bounce back stronger next season, and both teams will want to win this game and at least give their fans something to cheer at the tail end of the campaign. Barcelona have relied heavily on Tyrese Rice this season, the player chipping in with an average of 13.1 points per game and an average of 5 assists per game this season, and he is a player that Maccabi know all about. This is because Rice was a Maccabi player when they won the Euroleague in 2014. Petteri Koponen has also been in fine form for the Catalan club this campaign, providing an average of 10.2 points per game this season. Victor Rudd has been a key player for Maccabi so far this season, with an average of 9.8 points per game and Devin Smith has notched an average of 9.6 points per game this season. Diamon Simpson is a recent signing and he has offered an average of 10 points per game for the Israeli side. Gal Mekel is likely to be the point guard for the away team, which is down to the fact that Andrew Goudelock, DJ Seeley and Yogev Ohayon are all injured. It is very difficult to predict how these games will go because both sides have been hugely inconsistent this season and now that they have nothing much to play for, motivation may be at an even lower level. Home advantage may have some impact and with that in mind, take FC Barcelona Lassa, at -7.5 at odds of 1.90. If you’re looking for the Over/Under market, go UNDER 157.5 at odds of 1.90. Bet Now!